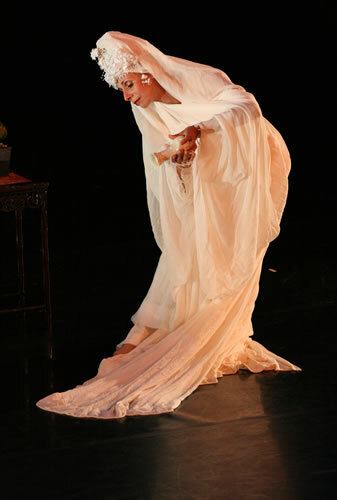 Livia Vanaver performs Ruth St. Denis's choreography in the show "Muses", at Kaatsbaan International Dance Center. 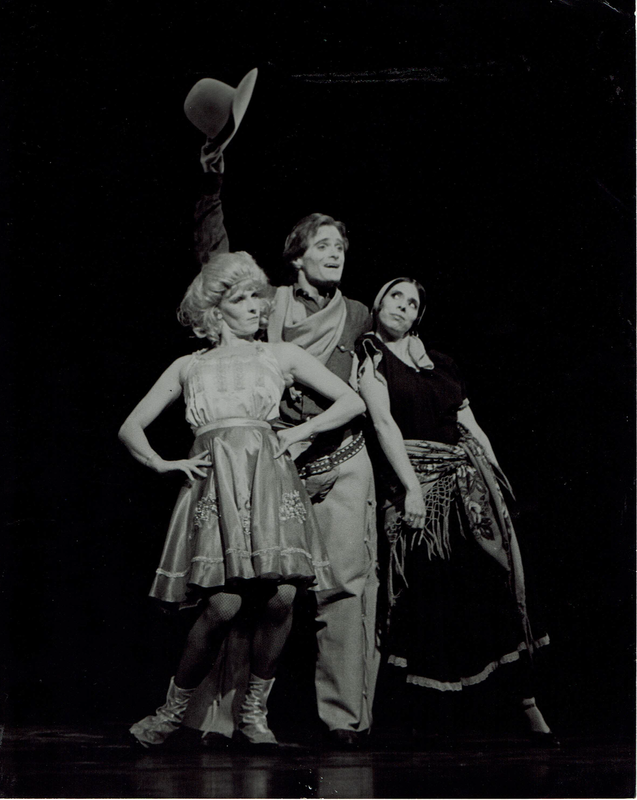 In the summer 1982, former Denishawn dancer, Jane Sherman, recreated all Five American Sketches for The Vanaver Caravan in honor of the historic 50th Anniversary of Jacob's Pillow. 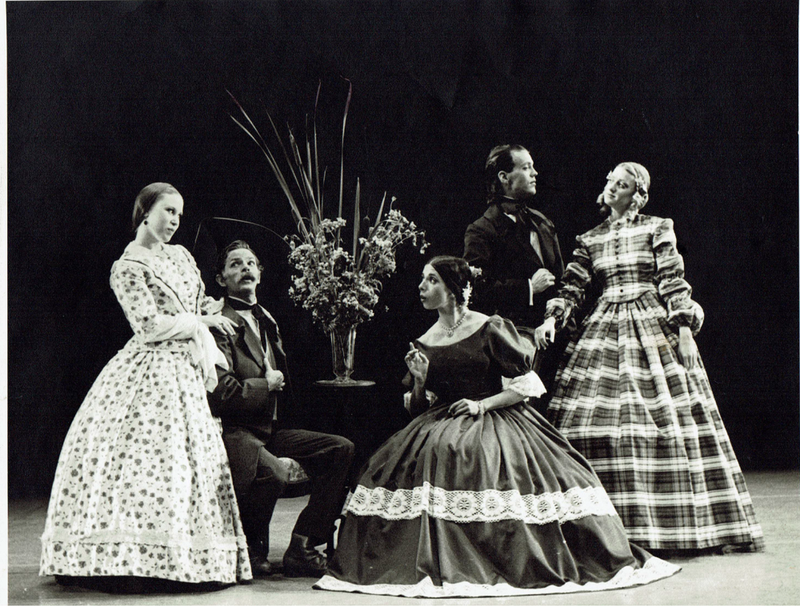 In 1990, The Vanaver Caravan presented a program of Denishawn recreations along with the Denishawn Repertory Company at the Pillow preceding their 1990 tour in France for the Bienalle de la Danse in Lyons, where The Vanaver Caravan was chosen to represent traditional American and early modern dance in America. 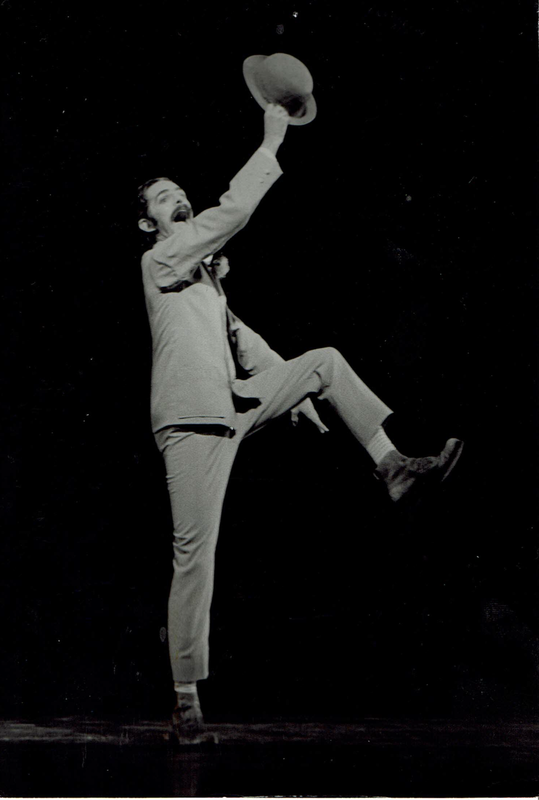 "5 American Sketches" and other works were choreographed in the 20’s by Ted Shawn as part of the suite which includes “Boston Fancy: 1854.”, "Around the Hall in Texas", "A Gringo Tango", "Danse Americaine" (about a mill town dude), and "Pasquinade" which are all based on comedic & historical American slices of life. "Boston Fancy: 1854", originally choreographed in 1924 by modern dance pioneer Ted Shawn, was recreated for The Vanaver Caravan by Jane Sherman, youngest member of the Denishawn company in the 1920’s. Based on pantomime and New England contra dancing, with beautiful period costumes, this comical dance farce is set at a formal party on Boston’s Beacon Hill. Its modern premier was at Jacob’s Pillow on August 7, 1982. "Tillers of the Soil" (a duet inspired by a day in the life of 2 Egyptian peasants) & "Bakawali Nautch" (solo Indian inspired dance choreographed by Ruth St. Denis in 1916), and "Legend of The Peacock" (solo dance choreographed by Ruth St. Denis in 1914). 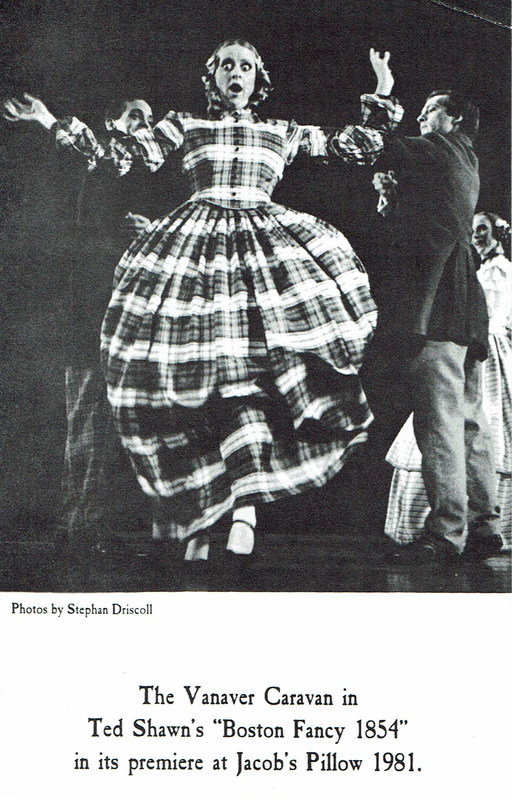 All three dances were recreated for The Caravan by Jane Sherman. 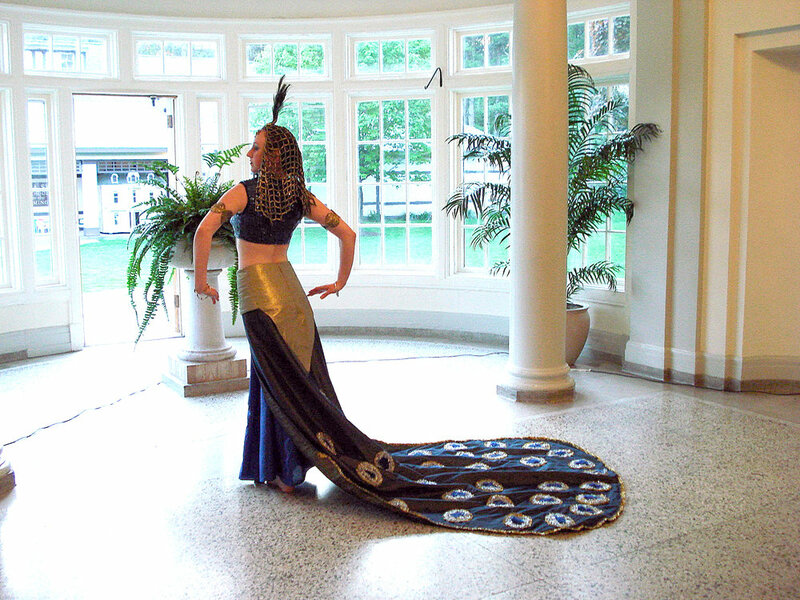 All Ruth St. Denis dances were recreated by Jane Sherman with generous funding from the NYSCA Dance Program. Jane Sherman, (1908 – 2010): born in Beloit, Wisconsin. She was the youngest member of the Denishawn Dancers on their tours of Asia and the United States from 1925 to 1928, when she joined the first Humphrey-Weidman company. She is the author of Soaring; The Drama of Denishawn Dance; Denishawn: The Enduring Influence; and coauthor of Barton Mumaw, Dancer. On videotape, she preserved for posterity the largest St. Denis-Denishawn repertoire in exisitence. She re-created programs for Denishawn Repertory Dancers’ concerts in France and the U.S., and revived Denishawn works for The Martha Graham Company, The Philadelphia Dance Theatre, and The Vanaver Caravan.